This durable brass faucet adapter converts one faucet into two. Standard 3/4" hose thread connections easily attach to your outdoor water spigot and garden hoses. 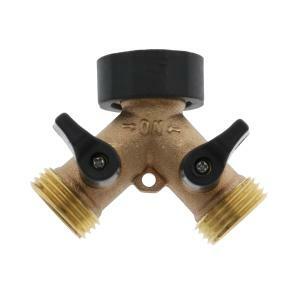 Leak free ball valve allows you to adjust the flow independently. Comfort grip on female swivel connection for easy hand tightening. For use with cold water only.